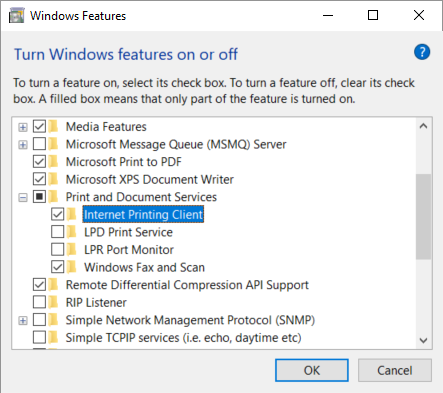 On a Windows computer, when you open the Printer properties dialog, and select the Ports tab, the Printix printer does not have a selected Internet port. RESOLUTION: Enable Internet Printing Client on the computer. When Printix Client is installed it should automatically enable Internet Printing Client on the computer. However, their might be a policy on the computer that prevents this Windows feature from being turned on.